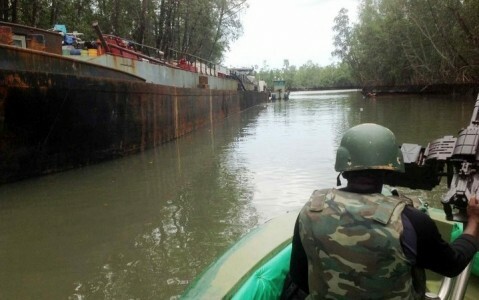 A vessel mv sea express laden with some 2,500 tones of crude impounded by joint task force in the niger delta, operation pulo shield at okuboto creek in bayelsa state. Nigeria loses billions of dollars annually to crude oil theft. The presidency has accused multinational oil companies of complicity in the increased rate of crude oil theft in the Niger Delta. The Special Assistant to the President on Amnesty, Kingsley Kuku, has said the companies are aware that their Nigerian employees engage in oil theft in the Niger Delta region and do nothing about it. Mr. Kuku also alleged that highly placed individuals and groups were sponsors of those stealing the nation’s crude oil. He said the process of illegally extracting crude oil from the pipelines in the coastal areas require highly technical and mechanical expertise which ordinary Nigerians or residents of the oil producing communities do not have. Fielding questions from journalists at the State House, Abuja, Mr. Kuku absolved Niger Delta governors of complicity in the crude theft saying there was no evidence of their involvement. He insisted that oil theft was an international crime and urged the international community to go beyond coming up with penalising oil theft as an international crime, and support the efforts of governments across the Gulf of Guinea and other parts of the region in dealing with these crimes. “The best you can find the level of Niger Delta people or some merchants of this trade are those doing menial jobs in it. “You will need high grade vessels and where you cannot load your illegal or oil theft, you are definitely going to find yourself in a mess where you will have to pay huge sum for demurrage, how many Nigerians have the capacity to do that? Very few people,” he said. “So it is an international crime, I have never heard about any governor being involved. I know of one thing and this is the bombshell that there are workers in the oil and gas industry who have the expertise, who have the technical know how, who know about the ways and means of sabotaging the oil and gas industry, who are likely to be involved. “I also know and this is critical and I know that a lot of multinationals will be angered by this but their being angry is not a bother to me but what bothers me is about oil theft that is affecting the revenue of this country, that is affecting the environment that I am from, that is very key for me. “So you have a situation where some pipeline protection contractors empowered by the oil companies, this is not about NNPC, is not about PPMC. You know almost every oil company has pipeline protection contract, pipeline surveillance contract for local security contractors. The same people who are meant to be securing these pipelines participate in oil theft. So the oil multinationals must look inwards their contracting process, their procurement process, look at the status of some of their vendors and security contractors, x-ray them, review their processes very well and deal with the issue of oil theft as it affects participation in house in the oil and gas industry,” he added. Speaking on whether the nation was winning the battle against oil theft, he said though the federal government has made tremendous progress, it still needed the cooperation of the international community. “I want to say that the federal government has taken very great steps in dealing with the issues of oil theft. It’s not going to be won in single day. It is a very specialised and mechanised crime issue. It’s not a crime committed ordinarily by poor people; it’s a crime committed by a very organised people but is a matter of demand and supply. It’s an international crime and the federal government is taking steps like I said even to the U.K., to South Africa and the U.S. and has urged them to participate in dealing with it as an international crime. “If there are no international buyers there will be no local suppliers and this is the essence of the battle. They (international community) also claimed they will need local enforcement of laws within the country to participate in dealing with it as an international crime. The essence is not those who are involved here locally, is basically about those who bring high quality funding for this crime and is not a crime that is executed unfortunately in terms of implementation within our shores. Is off the Nigerian shores so they are either coming from Europe, Americas, so there is need for the international community other than creating penalising codes against oil theft as an international crime, they must support us across the Gulf of Guinea and other parts of our region – the Niger Delta in dealing with these crimes”. Multinational oil firms including Shell, Agip and Chevron have complained of increasing rate of oil theft and sabotage of their facilities. Nigeria is estimated to lose about $6 billion annually to oil theft. The theft occurs despite the amnesty granted militants which has seen the federal government spend billions of Naira with some of the militants also securing multi-billion Naira security contracts from both the companies and the government. On the role of the illegal refineries in the Niger Delta, Mr. Kuku said, “Yes we use to have illegal refineries but after Mr. President issued the directive, the Nigerian military have been expanding their mode of operation and rules of engagement in dealing with the issue of oil theft and bunkering. They have been able to wipe away the issue of illegal refineries particularly in Rivers State and most other parts of the Niger Delta. The Navy in particular has been dealing with those involved in illegal refineries. Even on this I have my take, if the people who are not specialised in drilling, refining can create that kind of ways and means to turn crude to kerosene and fuel, as evil as it is, there is something positive about the fact that our people can be that creative. So we need to re-channel that energy to something legal. So it’s just not about stopping it, is also about identifying those who are involved and getting them to channel their energy legally and positively in the oil and gas industry, at the level of local participation, communities in the region”.